Children before the age of seven are very connected with dimensions beyond our own 3rd dimensional reality and I am always fascinated when they start sharing what they see around them. 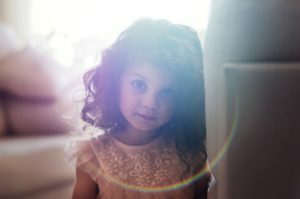 A few years ago, I received a call from a mother with a 4-year-old daughter. They were visiting an aunt’s home for a few days and were taken by surprise by the little girl’s reaction when walking into the room they were going to sleep. The daughter immediately announced that she could not sleep in that bed because there was a man already sleeping there. It turned out the aunt’s husband had died of a heart attack in that bed six months earlier. The woman didn’t realize his spirit was still there so they were actually thankful the daughter could see him so he could be released. This prompted a phone call and we released his spirit. I love hearing and seeing the reaction of adults now when a child in their life shares this kind of information. Instead of telling the child it’s her imagination or that she’s crazy, they immediately believed her and made a phone call to someone who could help. This confirms for me that we are opening up to different realms and dimensions and even if we can’t see spirits for ourselves, we are believing the children who are.